Wheel alignment or alignment is standard vehicle maintenance that involves adjusting the angles of the wheels to the manufacturer's specifications. Alignments help reduce tire wear and prevent the car from pulling to one side. To ensure your car or truck is performing properly, have your vehicle checked regularly for alignment issues. 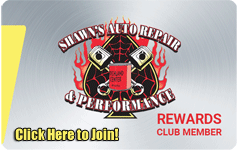 For all your auto & truck alignment needs, call 608-649-2886 or visit Shawn's Auto Repair and Performance in Richland Center, WI 53581 today.